Very good wish they were hotter. These were filler to get me into free shipping. 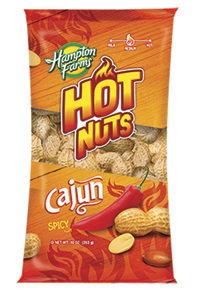 They are tasty, typical cajun spicy, not very hot or exceptional in any way. These things are delicious. I can't stop eating them. I buy these for my husband and family/friends every year as Christmas 'gifts'. I also buy extra for our house. We love them. Not knowing initially what to expect from these peanuts I can say that I wasn't disappointed. They are crunchy and tasty with only a few pieces being over dry. They do make a big mess but worth it. These have very little heat, but a great flavor. If you are looking for real heat, they aren't for you. If you are looking for tasty peanuts with a little zip. I recommend. I can not get enough of these nuts. They are soooooo tasty. I had to stop sharing them at work because now everyone wants some. Can not wait to get my new supply. My husband loves these spicy peanuts - will def. be buying more soon! Thank you! They are just right, not too hot. Oh my gosh these nuts are so darn good. Everyone loves them. Highly recommend them. I can not get enough of these things. Gave some to a friend, who shared them with another. She then tracked me down to find out where they came from. Guess that says it all. Yum. I really love these, perfect snack for anytime like now. I am munching on them writing this review. My son buys these for me for every occasion. I look forward to the special treat! They are the best! I want to get them in 25lb bulk...WOW THEY ARE GREAT!!!!!! We just got these nuts and are Immediatly buying more. These peanuts are very flavorful without being outrageously hot. They made a great snack! Well these are FANTASTIC! super hot but still has the wonderful flavor of the peanut. I eat the shell and all.. and BOY HOWDY.. these are great. am on Weight watchers and wanted a snack. can have 10 for 1 pt. Thats all I could eat. PS dont inhale while chewing.. enjoy.. Im off to order more!